Every evening for the past 21 days, without fail, I have put on my Fancy Clothes. I have not washed them during this 21 days. They are, might I add, Very Fancy. They consist of purple compression pants, a sports bra and an oversized t-shirt with my initials on it. They are Fancy because I do not run in them, although I do sleep in them every night. I am very strict about my daytime clothes and my evening clothes. I have to be. I am three weeks into a run from Rome to London and every day, I produce an obscene amount of sweat. It is highly important, therefore, for me to have clothes that I can wear which have not been sweated in and, hopefully, do not smell. I am a pilgrim and in the pilgrim world, you move forward from place to place, you stay in the pilgrim accommodation every night, you make new friends, you cook together or go out to eat together, you visit the launderette together and generally have a great time. In the pilgrim world, my Fancy Clothes arefancy. 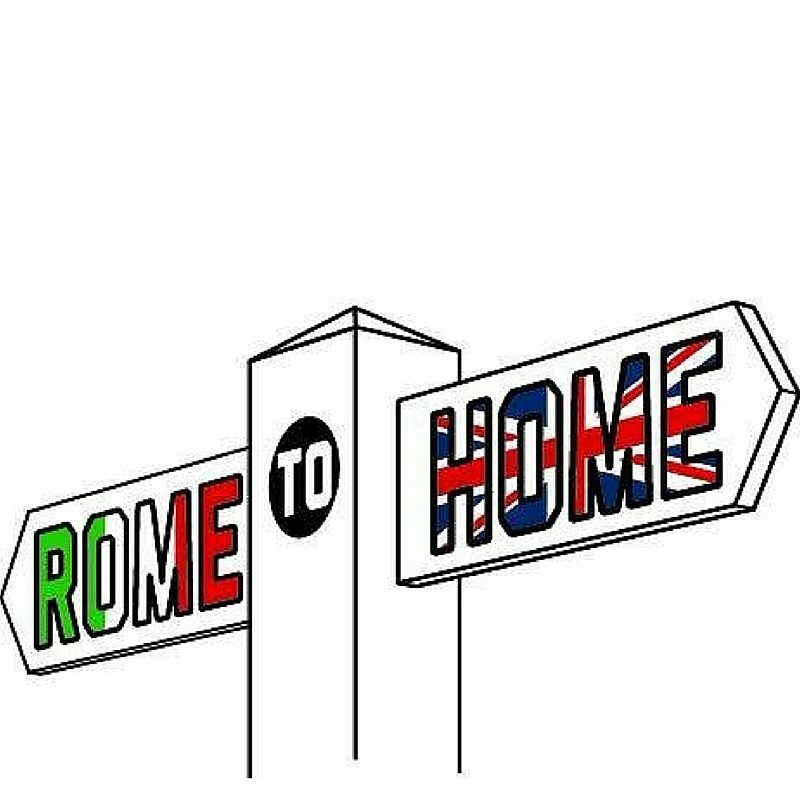 After 16 days on the road, however, I found out that friends were staying nearby and I left the Via Francigena pilgrim route for two days to go and spend time with them. One of them lent me a bikini and up we headed into the mountains for a day of relaxation. You can rest assured that I looked absolutely ridiculous. My non-fancy daytime clothes are my ‘uniform’ and have been worn every day and therefore my tan is in the exact shape of these clothes. Sunbathing next to a mountain spring with my friends revealed my pasty white shoulders, stomach, back, feet and top of legs, yet displayed my impressively deeply tanned legs, neck and arms. My scratches from trying to climb through foliage when lost in the forest earlier that day showed up bright red, as did the odd bruises and bites that are scattered over my body. Beach babe, I was not, trust me! But life on the road is wonderful. Every day is a new treat. Today I spent hours scrambling over rocks and streams on mountains covered in forests. 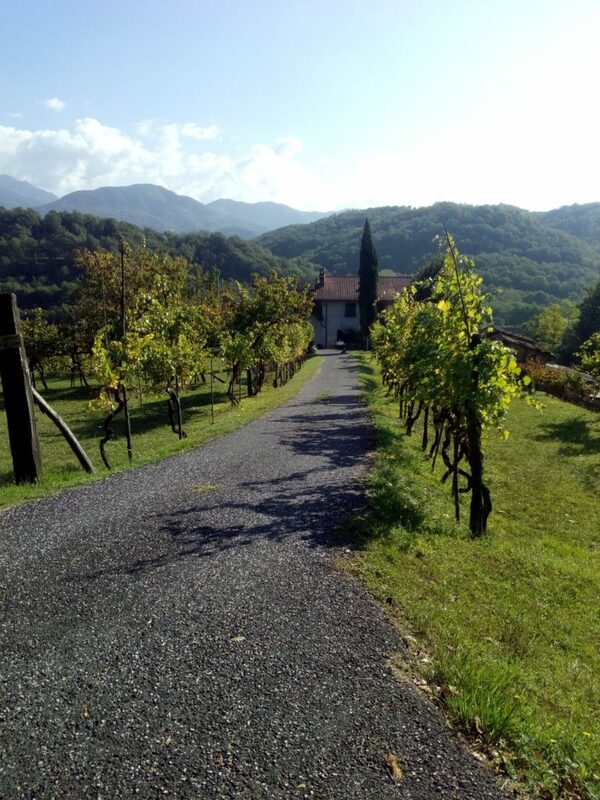 A few days back, I was running through the rolling hills of Tuscany and staying in enchanting medieval villages. In my first week on the road, I was traversing hazelnut-littered footpaths next to caves and getting lost by gorgeous lakes. I have stayed in a nunnery in Siena, a 1000 year old Cistercian Abbey in Abbadia Isola where a monk washed my feet, a convent in San Gimignano where they tried to send me away and countless other wonderfully old religious institutions. Of course, I am still me and I have still ended up in a fair few ridiculous situations, the main one being when I was ‘trapped’ inside a nunnery in Bolsena. I had used the key to exit the building the evening before to get dinner so when I went downstairs the next morning and couldn’t see a key, I panicked. I knocked on all the doors I could find, I shouted, I debated jumping down from an upstairs window, I rattled the door frantically. After about 20 minutes of this, I noticed a light switch on the wall. I’m not sure what my incentive was to put the light on or how I thought it would help my escape but I switched it on anyway…. it was the release button for the door. Of course it was. Out I went, regaining my composure, to pretend that it had all never happened. There was the time when I saw some biscuits on half price, bought them and later realised they were dog biscuits. There was the time when I was speaking with an Italian man and asked him to repeat an Italian word he had said. He said, ‘piano’, I heard ‘ti amo,’ which I repeated for clarification, thus telling the poor man that I loved him. There was the time when I bought maps for the route, not realising they were driving maps, and followed blindly until I realised that I had stumbled onto a motorway and, for lack of other options, kept going anyway. After about an hour of this madness, climbing through brambles and almost stepping on a snake in the process, a police car pulled over and a flabbergasted policeman got out to ask what the hell I was doing. “Non so,” I replied feebly, I don’t know. And then, by way of an excuse, “Sono una pellegrina.” I am a pilgrim. “E molto pericoloso!” he warned me, it is very dangerous. I nodded again, forlornly, while he told me that in about five minutes I would reach a walkway over the motorway and a footpath leading to the town I told him I was going to. “Grazie,” I thanked him, while I blundered off, red-faced, hoping not to get flattened by a large truck before the walkway. 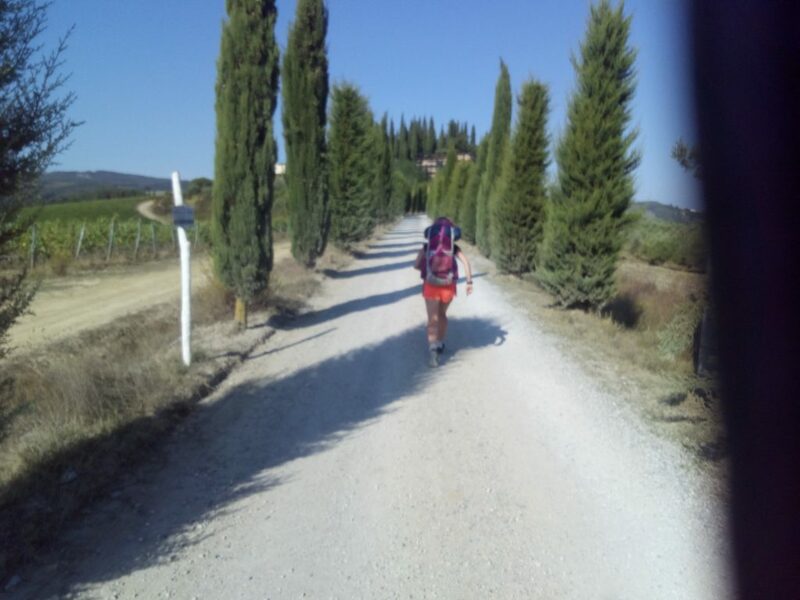 There is a huge element to this run that I had not realised would play such a part for me – my fellow pilgrims. I have met and kept in touch with some of the nicest people; people who have shared their evening meal with me, paid for my laundry when I didn’t have change, told me about the lesser-known places to stay when the accommodation was full, given me snacks or cold water when we pass during the day. When I left for my pilgrimage, I didn’t expect to have enough space in my life for so many extra people but I have been proved wrong. I am incredibly glad that I have. Now, as I sit here in my Fancy Clothes, I am remembering a thing that occurs to me at least ten times every day, that I am so very privileged to be in a position to make this journey. I know that many can’t and I am so fortunate that I can do what I am doing. I am also fortunate that the abbey I am staying in tonight has free wi-fi and a computer I can use to write this!